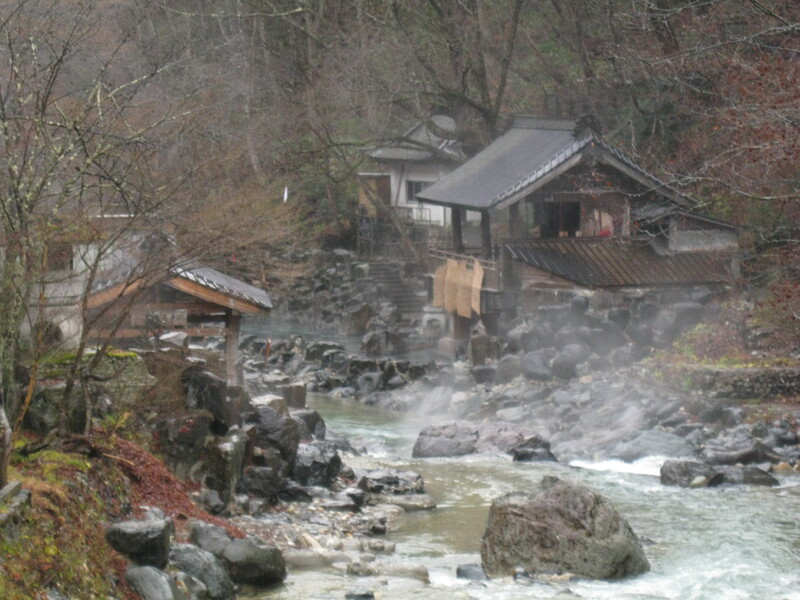 One of the highlights of our trip to Japan was the discovery of Japanese onsen (hot springs). Apparently the word can be used as a noun to describe a hot spring, but also as a verb to describe the act of bathing at a hot spring. 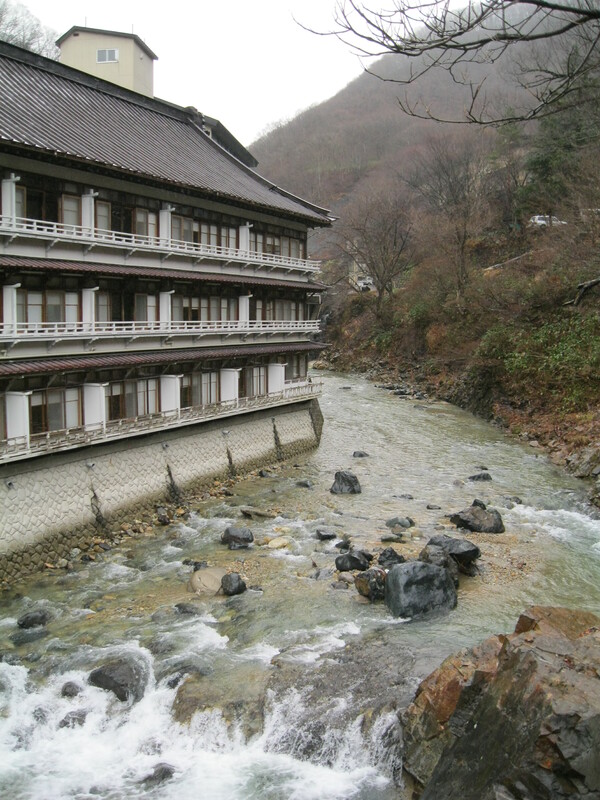 We spent one night at the Takaragawa Onsen near Minakami in the Gunma province. 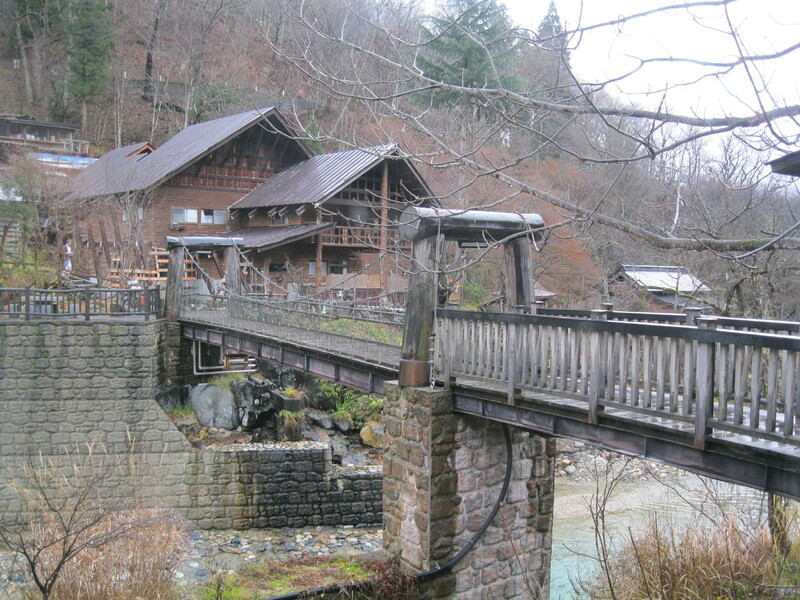 It was about 2.5 hours north/northwest of Tokyo, and was located alongside the Takaragawa River in the mountains. The journey there was quite pleasant, a long train ride and then a private bus for about 30 minutes along a winding mountain road. 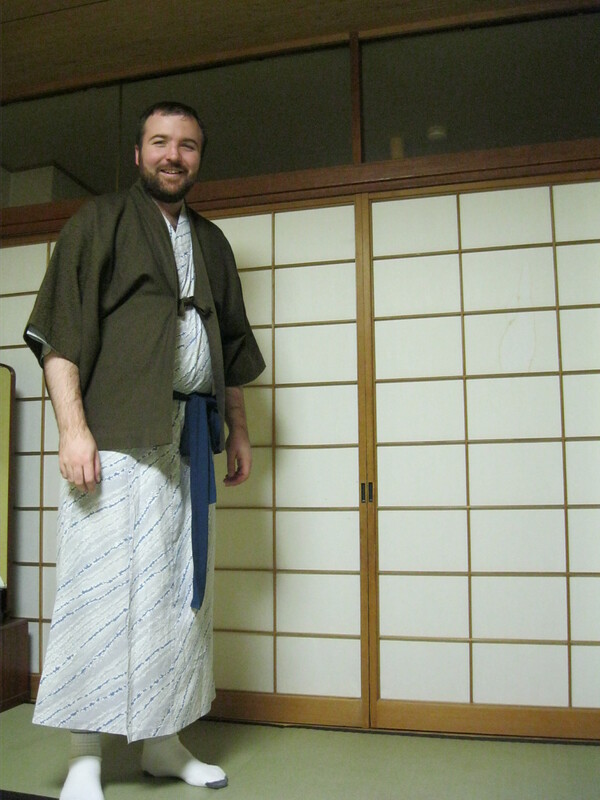 The ryokan (a traditional Japanese inn) associated with the onsen was a bit larger than I expected, but it was still lovely. 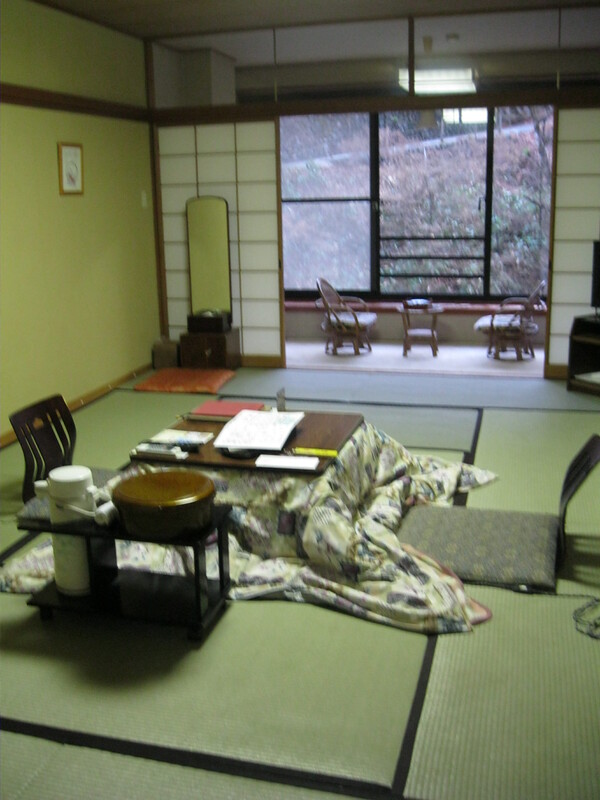 We stayed in a washitsu (a traditional Japanese room), that had tatami mats, no chairs, and a small table in the center of the floor. There was a small alcove that had two wicker seats overlooking the river. Unfortunately it was quite cold out there, so we spent most of the time with the fusuma (sliding doors) closed to preserve the heat! I have to be honest and admit that we both struggled to sit on the floor for the meal. It’s hard to access the little table unless you’re really up on your knees, but I could only do it for a few minutes, and Alex wasn’t really flexible enough to get there! Luckily our room attendant was sympathetic and brought us towels, so we could sit Indian style. After dinner we went to explore the onsen. It’s such an amazing setting, it’s hard to find words to adequately describe how beautiful it is. 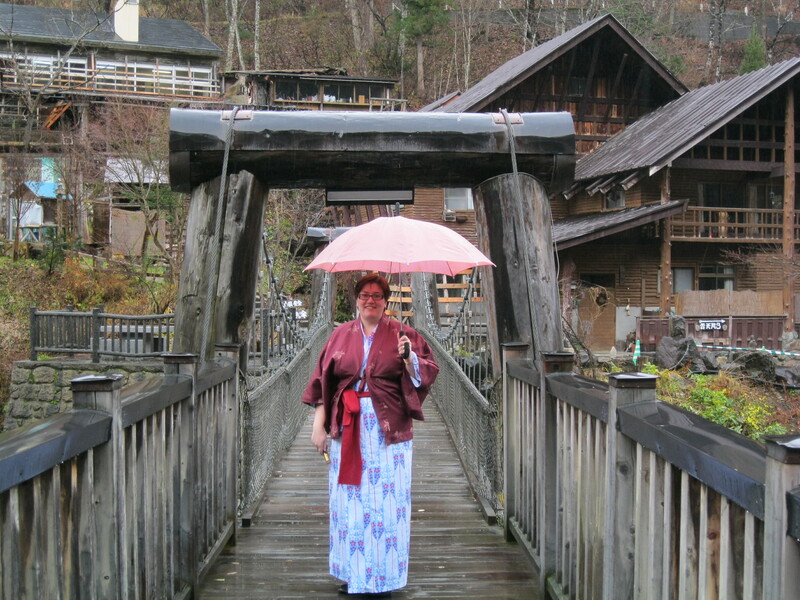 You have to walk through the inn-complex, and then exchange your house-slippers for outside-wooden shoes (or gati) (NOT our own, ones provided by the ryokan), and cross this gorgeous bridge. Then you have to walk downriver and around a curve (so as to be out of sight from the main buildings). This is important because onsen are naked! 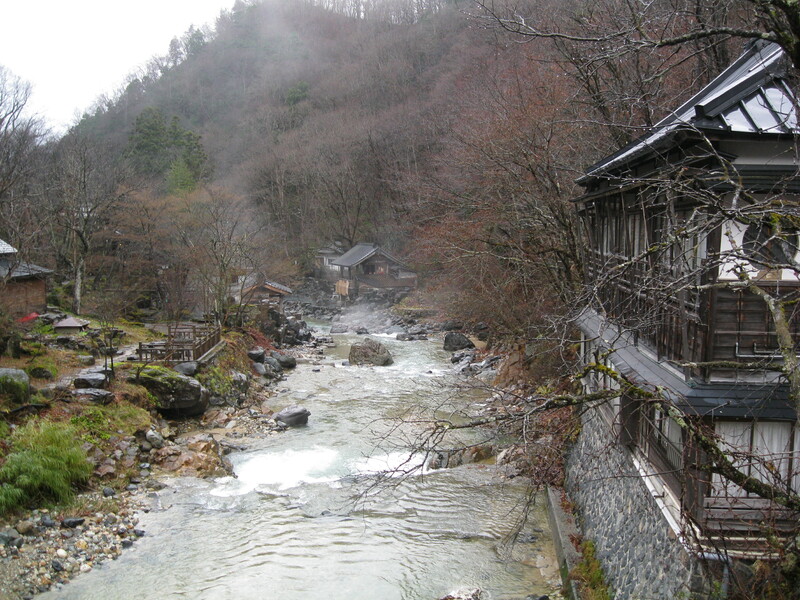 Most onsen in Japan are gender-separated, so men and women bathe separately. But we booked at Takaragawa because it was mixed-gender, and we could be together. Don’t overestimate us though, we were both pretty intimidated by the thought of being naked in front of hundreds of Japanese people! Luckily for us it was a Sunday night in the off-season, and it was pretty rainy, so there was hardly anyone there. There are 4 big pools at Takaragawa: one just for women, and three mixed. We started off in one of the larger pools, and for over an hour we were the only people there! The pools are placed directly beside the river – it’s so close you could probably reach your hand over and touch the river water. Because of a few rapids there was a really nice sound – and the mountains surround you – so it’s a really amazing experience. I don’t have any pictures of the actual baths themselves, because of the naked people. You’ll just have to use your imagination! Even with a slight drizzly rain, it was easily one of the most amazing experiences in my life. After a while, several other couples joined us, but it was large enough that found a secluded corner. When entering the pool or walking around, men hold a small towel (about the size of a face cloth) over their bits and pieces. Once they sit down, most of the men folded the towel and put it on their heads. Women are told that they should wear a towel directly into the pool, and if no one else is around, can then drop it. But since the water is crystal clear, there’s not much hiding! We probably stayed in the hot water for too long, because when we got out we both exhausted. But we took a quick dip in one of the other pools to see if it was any different (just deeper), and then headed back to the ryokan for bed. But I shouldn’t really call it bed, because it was just a futon on the floor. 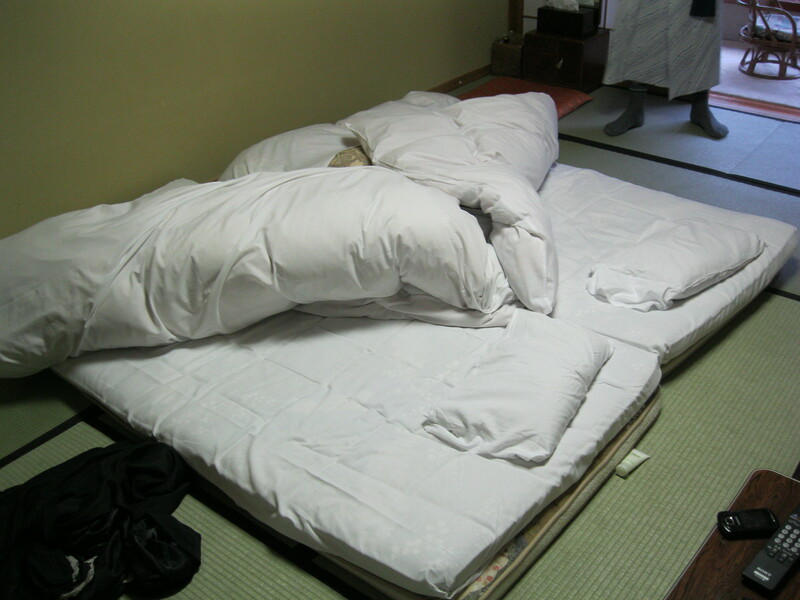 They very nicely gave us a double-futon, so it was twice as thick as a traditional pad, but it was still pretty hard! Luckily we were pretty wiped out from the water and slept quickly. After breakfast we explored a bit around the property, including a trip to see the bears. 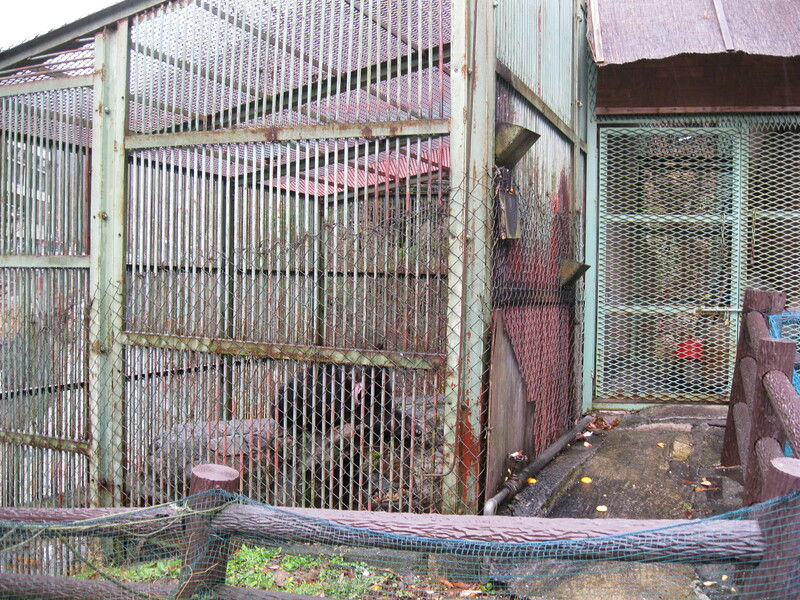 Yes, not only does Takaragawa serve bear soup, they also have six captive bears they keep in cages. This really made me sad, as the cages were terribly small and with horrible iron bars. The poor bears looked very unhappy, and were pacing back and forth constantly. I think this kind of ruined the experience for me. I don’t understand the cultural significance of bears to Japanese culture, but any way you cut it, this was animal abuse. The room attendant made a big deal of telling us that the bear meat in our soup isn’t from THEIR bears, it’s from other bears, but it seems to me like a mixed message. And then it was time to leave Takaragawa and head back to Tokyo. 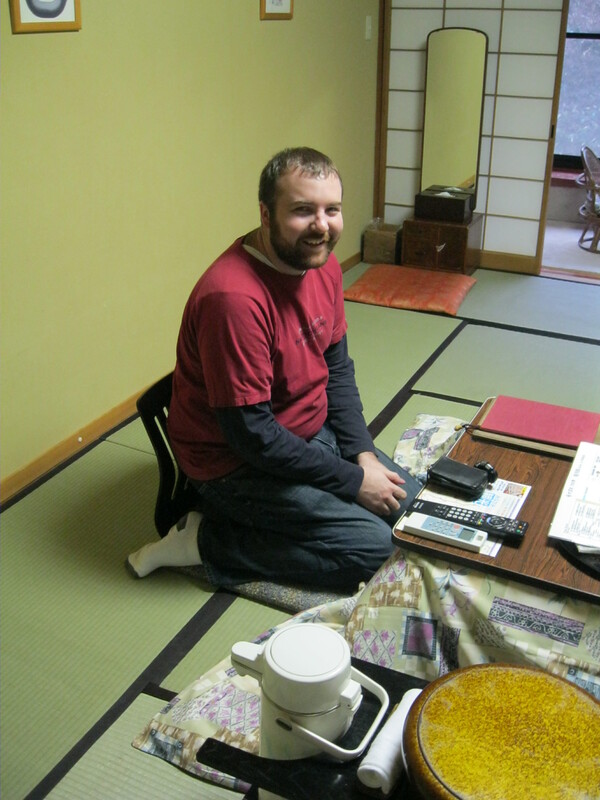 We were both very sad to leave, and convinced that onsens are the most amazing thing ever. The whole concept of ritualized bathing is missing in Western culture, it seems to me, and it’s a very peaceful and relaxing experience. 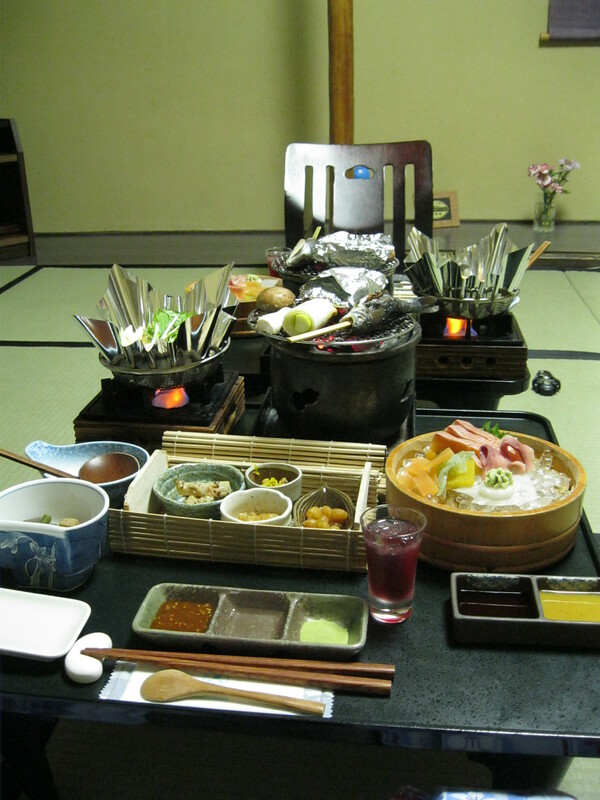 Posted on 25/12/2011, in travel and tagged Asia, Culture of Japan, Gunma, japan, Japanese people, Onsen, ryokan, Tokyo. Bookmark the permalink. 1 Comment.